If you shoot me, you better shoot straight. People are beginning to refuse service to members of the Trump administration and I, along with Rep. Maxine Waters (D-Calif.), are living for it. Recently, Department of Homeland Security Secretary Kirstjen Nielsen was heckled out of a Mexican restaurant in Washington, D.C....ironic, I know. The protest to her dining in the establishment was of course over her defense of Trump's zero-tolerance policy regarding illegal immigrants and separating children from their parents. Since early May, immigrant children as young as a few months old have been separated from their parents, detained by U.S Customs and Border Protection and placed in shelters all over the United States, while their parents await prosecution on federal misdemeanor charges. Over 2,300 children had been separated from their parents before someone mentioned to the idiot-in-chief that he had the power to stop the separations. As of last week, officials stopped separating children from their families, but a plan to reunite those already torn apart has yet to be formed. The greatest fear is that many of these children will never see their parents again as they have already been deported. "Efrén Olivares, a lawyer with the Texas Civil Rights Project, has spent days interviewing detained adults and working to document family separations....Olivares interviews parents quickly before their criminal sentencing hearing at a federal courthouse in McAllen, Texas, writing down as much identifying information as possible and then trying to track down their children. "It's all-consuming," Olivares said earlier this week. "If we don't document them, there's no record that these families are in the system," he said. "It's very, very likely that many of them will not be able to, on their own, look for their children, especially when they're detained and even after they're released — or deported, even worse." A few days after Nielson was chased out of a restaurant, Sarah Huckabee Sanders faced the same fate. According to a tweet by the lying White House press secretary, she was politely asked to leave a restaurant in Lexington, Virginia by its owner because of her work defending Trump's policies. Florida attorney general Pam Bondi was also booed out of a movie theater while attempting to see "Won't You Be My Neighbor?" the Mr. Rogers documentary—again, ironic. Since then, there has been a national uproar about the ability to deny service to, or "harass," public officials in public because of their political affiliations. A great many white Republican-folk have led conversations starting with something about "unity" and how "differences in politics shouldn't....blah, blah, something or another," but it got me thinking. Where the hell were all of these "good-hearted 'Mericans" when businesses were refusing service to the gay community? Or the black community? Or the Mexican community? *crickets* Yeah, that's what I thought. Let's get something straight, if you have knowingly aligned yourself with a man who hates people of color, believes Mexicans are rapists and murders, refers to young black men as thugs, makes fun of handicapped persons, does everything he can to oppress the LGBTQ community and separates children from their families while allowing them to be medicated with psychiatric drugs, you better know I will refuse service to you. "Let's make sure we show up wherever we have to show up. 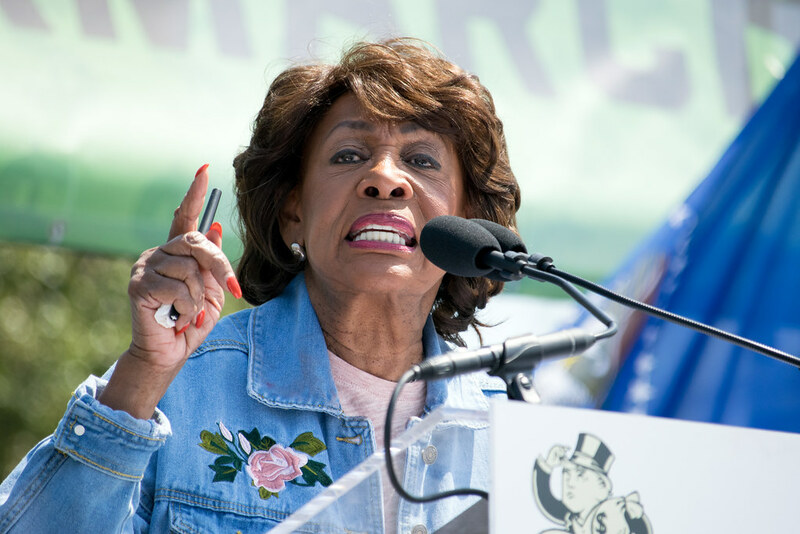 And if you see anybody from that Cabinet in a restaurant, in a department store, at a gasoline station, you get out and you create a crowd," Waters said. "And you push back on them. And you tell them they're not welcome anymore, anywhere. We've got to get the children connected to their parents." The idiot-in-chief then tweeted out this, falsely accusing Auntie of calling for violence against his lil' minions. Of course, Auntie had the time to set the man in the White House straight and get him together by reminding him of A.) the fact that she DID NOT advocate for violence against anyone and B.) all the times he's talked about "punching" people in the face and ruffing them up. She also took a firm stance defending her comments in the face of Democratic colleagues who attempted to distance themselves from them, *cough cough* Nancy Pelosi. 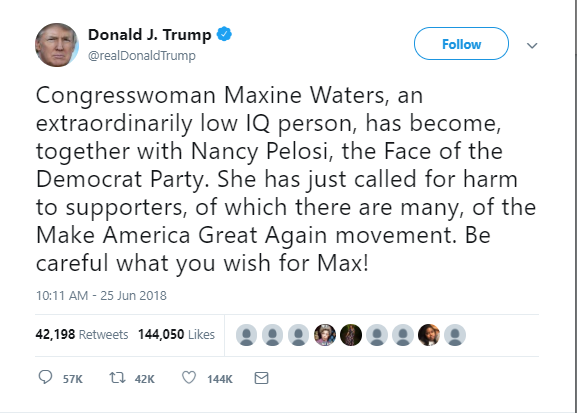 I, for one, stand with Maxine Waters. It's easy to call her names, say she has a low IQ, refer to her as Mad Maxine; I mean, at the end of the day, black women have endured that from white men for centuries. Like Malcolm X said, black women are the most disrespected group in America. But I am thankful to Auntie Maxine. Why? Because she is taking the force of their attacks like a boss for young women like myself and those to come. I also thoroughly understand her. Reminiscent of Fannie Lou Hammer, she is sick and tired of being sick and tired and so are we. Instead of a zero-tolerance policy on illegal immigration in a country where all but 2% of the population are illegal immigrants or decedents thereof, how about a zero-tolerance policy on racism and bigotry? The last time I checked, civil disobedience and protest (of which the latter is our constitutional right) are benchmarks of this great nation. Despite clear evidence that Maxine Waters DID NOT call for violence, Republican lawmakers are still calling on a resignation and apology to the White House for endangering their lives for her audacity to forgo "civility." Can you imagine, a gang of white politicians lecturing a black woman born in 1938 on the indecency of being denied service at a restaurant? After receiving numerous death threats and being forced to cancel a few appearances, Maxine Waters had one thing to say at a "Families Belong Together" rally in Los Angeles, "If you shoot me, you better shoot straight." Auntie Maxine is not standing down and neither should the resistance. You can call it "rough," you can call it "harsh" and you can call it "loud", but you also need to call it "correct."